Indore: Union Health Minister Faggan Singh Kulaste said Centre is mulling to make it mandatory for doctors’ to work in rural areas for a stipulated time to overcome shortage and boost healthcare services there. “We are thinking over making rules and regulation to ensure that the doctors work in rural areas for a stipulated time. We are not averse to doctors practicing in urban areas but want to do away with their shortage in rural areas,” Union Minister of State for Health and Family Welfare Kulaste said at a function here. He said that the Health Ministry was pondering over a proposal to give pre-eminence to medical graduates who had worked in rural areas in the pre-entrance test of PG courses. Kulaste said to do away with the shortage of doctors, 10,000 seats in MBBS courses have been increased. He said that according to a report of World Health Organisation (WHO), a special drive will be undertaken to eradicate tuberculosis in Madhya Pradesh, Chhattisgarh, Rajasthan, Gujarat and Jharkhand. Before the decision is taken I think He will be out, the Minister and secretaries keep on changing quite often. The New one\’s Will come out with some other funny and Fancy ideas .And most of their plans will remain on the Papers. These papers start collecting dust in the Dirty cupboards. The end results back to square. Delay is Deny. ACTIONS Speak louder than words………. Yes,A good move on paper.Difficult to put it into effect. Govt can bring in any rule to force Doctors into Rural Service.Doctors will have no objections to serve the rural population either.But the duty of the Govt end with making Doctors to go into Rural Service. IT IS ALSO THE DUTY OF THE GOVT TO PROVIDE THEM WITH AT LEAST THE BASIC AMENITIES TO LIVE THERE.WHY DONT THE GOVT MAKE THE SALARY MORE ATTRACTIVE,PROVIDE THEM WITH BETTER HOUSING FACILITY,PROVIDE OTHER AMENITIES LIKE WATER,ELECTRICITY etc.LET THE GOVT WEAVE THE MAJIC WAND AND THEN SEE THE EFFECT !! 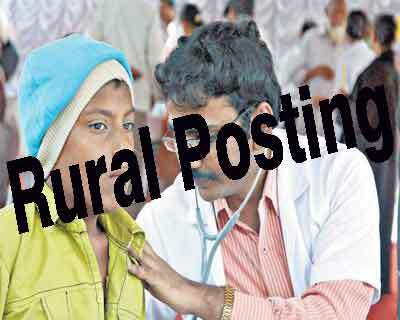 urban areas are lacking proper health cares ,without any proper facilities in rural sector its just a disaster to make rural posting compulsory ,instead give more financial benefits,surgical facilities, good ots &good phc ,chc buildings,proper manpower only then rural health will improve .its just a political step to earn rural votes just to send doctors to rural sector without any facility. We must change MBBS curriculum by scrapping internship and including the one year in clinical training including a rural stint. Students must be involved in patient care in the last five semesters under supervision ( like dental students and American students). Exit wxam should be at end if 5 and half years. This will ensure rural participation of final year students under a staff professor who shouldbe adequately remunerated. Clinical exams should be periodic point based Evaluation. Students will stoo wasting time on exam preparation.